6 Comments on Here are the All Different Types of Punching Bags! Heavy bags originally were created for providing resistance while you are striking. However, over the years we started seeing a lot of types of punching bags on the market But why is that? Because there are a lot of different and specific needs. For example, you might be an MMA fighter who needs to improve everything about striking and grappling or you may be an athlete who prefers improving physical attributes or building some muscle mass. So your need can be different than the others and one bag can be perfect for someone whereas it might be useless for you. 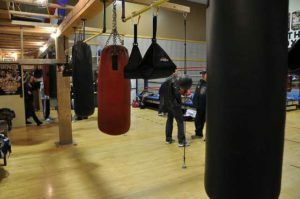 Basically training with a right punching bag for your need has a vital importance for your progress and below you can read explanations of ALL the types of punching bags and determine which bag type is suitable for your goals. When you think about heavy bags, probably this traditional bag type comes into your mind. It is also the first bag type which was invented and was used in the ancient Olympic Games. You can literally see this bag type in every gym including fitness gyms. Since it does not only provide you to improve your striking skills, you can also very well use it for improving conditioning or burning fat. These hanging bags are also preferred by people who want to improve muscle mass. So it is quite popular in “boxercise” classes. This bag type can be hanged to a wall mount or a stand and while it is hanging you can practice many different kicking, punching techniques and do footwork drills because it has to have at least a small area to swing. These traditional bags can be filled with a lot of different filling materials including shredded fabric and cement. As a side note, a punching bag requires you to fill three times of its volume if the filling material is one of these. The speed bag is another really important bag type for boxing, MMA… You can improve your speed, hand-eye coordination, which are vital for martial arts, with it. The shells are quite soft and punching it constantly doesn’t hurt your hands and just wearing hand wraps is enough for the protection. These bags have different shapes including teardrop and have seams. These are filled with air and even though some speed bags which are constructed in a way that these don’t have any bladder most of them do. However, the bladders come in one size so one size fits all and once it starts leaking, it can be replaced with another one easily. Speed bags come in different sizes and you can choose it according to your skill level. For example, big sizes are for beginners. Maize bags are considered as a subcategory of speed bag type since you can hit it and keep up a rhythm just like a speed bag. In addition to that, the shells of these bags are really soft and laces are extremely short. Even some don’t even have laces since this bag is designed and constructed for you to practice evading from punches so it should not cut or cause bruises. It is quite useful because believe me whether you are a beginner or not it will hit your head eventually. Another difference between speed bag and maize bags is that speed bags are filled with air whereas maize bags come as filled and it is generally filled with textile cuttings. Double end bags’ construction is the same as speed bags. These also have seams and bladders. Double end bags are tied with ropes, which are quite elastic, to anchors. These are more angular than speed bags and you can practice hooks, jabs… with them. You can move around the bag, practice footwork during a session. In addition to these, double end bags can actually hit you back! So you need to move your head, body, dodge and move according to it. So honing defensive skills can be done quite effectively with it. So when you don’t have a sparring partner and want to practice defensive skills and strategies it is the next best thing! Mexican style double end bag is just a different style of double end bag. It does everything that a regular double end bag can do. These include working on defensive skills, punching skills etc. However, recoil is quite different and after you strike it does not swing like a regular double end bag. After you hit, it gets away slower however it comes at you faster. The shape is also quite different. It is way bigger than regular double end bags. This bag basically provides a new experience. As you can understand from the name, these bags can stand on its own. The body is flexible and these tend to have less weight. While you are kicking the bag, the base should not move. So the base of freestanding bags is quite heavy and have soft corners for not to cause any injuries. In some cases, a free standing punching bag can fall on the floor. So the shells are sturdy enough to withstand it. The most commonly used cover material for freestanding heavy bags is synthetic leather and the padding is generally foam. The bases are suitable for you to roll and after you finish your training you can roll and just move them away within seconds. As a side note, after working out with them in an MMA center in Samut Prakan for years I experienced that the cover materials generally don’t hold dust. So these are quite suitable for home workouts. Also, these are ideal to practice various kicking techniques since the base is so low and allows you to do low kicks and knee strikes. There are even bags which are made specifically for this. You can do every striking technique, which you can do with standard punching bags, with this particular bag type. Furthermore, this bag type also has handles to practice clinch and various other striking, grappling techniques in MMA. So these bags are quite versatile. These offer classic bag workouts and provide you to practice clinch without hurting the body of the bag. Some of them even have handles for you to do abs and various bodybuilding exercises. Is not this just awesome? Considering these, MMA heavy bags tend to provide more bang for the buck. There are even ones which help you do crunches and you can even increase the resistance. You can seriously build an amazing body with these bags. Body Opponent bag is just a subcategory of free-standing bags however it has a quality which makes it quite special and an incredible training tool for fighters. It has a human-shaped torso and it also has a head. The other bags don’t have any shape whatsoever. Many of them just have a cylindrical shape and some are thicker and heavier than the others. When this is the case, we punch or kick aimlessly and it is harder to focus on where to land punches. Does this sound familiar? When I train with a regular bag, I generally don’t focus on where to land a kick however when you are training with a body opponent bag, you are less likely to have this problem. Because when there are body parts to strike like chest, nose, it helps you focus more on precision so you will get better at it. You can see how vital this is for fighters, right? This is why this bag type is my absolute favorite bag on this list! As a side note, if you are interested in this bag type, Century is the leading company when it comes to body opponent bag. Many people actually neglect to work on improving uppercuts. One of the reasons is that many bags just don’t have a design to practice this vital punching skill. There are a couple of different uppercut bag types. Some can be mounted to a wall and some are hanging type. However, the common point of these is that these have angular shapes and an area for uppercuts. This is why these bags are unique. These bags have shorter lengths and have less dense paddings. Because imagine that you do an uppercut with one of these bags and if these have quite dense paddings, your joints may not recover for a long time. There is also a possibility of knuckle and wrist injuries. So these bags have a lot of low-density foam. It is also quite interesting that you also don’t see this bag type in commercial gyms however many trainers in local gyms always want that their trainees practice with uppercut bags regularly. These bags are specifically produced for Muay Thai. The body of these bags has a larger area and has more dense foams so this part is way heavier than the other parts. So when you do teep, it actually moves just a bit like a real person. It also has an upper compartment and it lets you clinch as well. Considering the tricky design, I am really not surprised that only really famous Muay Thai gear brands produce this kind of a bag. The body part has the most of the weight and it can be still manipulated with a clinch so the design and adjusting the weight distribution are really hard to pull it off. The head part is also small like a real opponent’s head and it is made for enduring the head kicks. Even though Muay Thai is a quite popular trend and grows for a decade due to the this bag’s unusual shape and lack of advertising, we don’t see bowling pin punching bags on the market for a couple of months in a row. The center of gravity is quite low and this bag basically moves way more than usual. It is the safest bag for your hands, wrists, and joints. Firstly water absorbs the impact better and more than any other filling material out there. Also, the cover material tends to be really soft. Because after you hit the bag, water changes its place and cover material needs to adopt this change so it stretches. So it is extra soft as well. As a result, your hands and wrists take far less punishment with this bag. So this bag type is the first option when it comes to the safety. Even many MMA gloves are “enough” for the safety. Aqua bags help you have a more natural experience and if you are bored of hitting the bags which have sand as filler, then you may want to give water punching bags a shot. This bag is quite similar to bowling pin heavy bags. You can also practice teeps with it. However, it does not have a “head” part and you can’t clinch with them. Other than these, there is no difference. However, due to the shape, this bag’s center of gravity is also quite low and it is even lower than a bowling pin heavy bag’s center of gravity. As you can guess this bag type can swing like crazy and does not let you practice footwork. However, the striking surface is quite large and even though it is not a good place to practice precision still it is fast so your strikes need to land on right places. So it can be also usable for that. Due to the teardrop shape, it does not sink a lot after the impacts so don’t worry you are not striking less powerful. This is just about the bag’s construction. Considering that, it swings fast you should definitely use reinforced chains for hanging this bag type and you need to make sure that these can withstand the hard blows. This bag’s main purpose is to improve the reflexes. This bag comes in a couple of different shapes. There are ones which are quite thin and these are quite hard to punch in rhythm. After a punch, they come at you fast and it is even harder to punch them the second time. 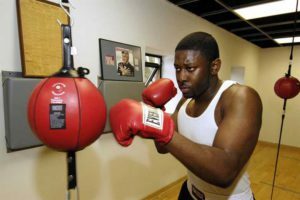 Mastering how to punch these bags can be a quite irritating process and generally, it takes at least 4-5 sessions to learn how to strike. There are also ones which are speed bag shaped and these also have the same features. Reflex bags are great for improving hand-eye coordination as well so you need to watch every move closely and in this case; it is amazing for concentration as well. These punching bags are basically made for martial arts which include kicking like kickboxing, MMA, and Muay Thai. These bags are extra long and the base almost touches the floor so you can practice knee strikes and various kicking types without any problem. However, due to the less thickness, this bag type has less weight and because of the shape it also swings faster than usual. So moving around this bag is impossible even if you strike lightly. So practicing “real footwork” is not possible with this bag type since it is very fast. However, these can be used for improving reflexes. The filler needs to be distributed evenly throughout the bag. If it settles at the bottom, it swings oddly and way slower and it becomes useless. You can punch these as well and these provide resistance so these are also considered as punch bags. The main purpose of these is honing the punching and kicking techniques like front kicks to different positions. Obviously, the holder’s expertise is quite important here. Since the holders determine the difficulty of workouts and combinations etc. Practicing your punching and kicking technique is the way to go with these since power shots can actually hurt the mitt holder’s wrists and forearms. Especially these power shots can be pretty harmful to the joints. Even a kick shield, which has the densest padding in the world, can’t absorb the shock fully. There is actually even more heavy bag types however the other ones are not worth mentioning or just a subcategory of one of the types above. While choosing a bag type, firstly you need to consider what your goal is. This goal can be improving striking skills or just to have a fit body or you may just want to train with a safer bag which is easier on your joints. There are many factors to consider and after deciding these, you can get your bag accordingly. So this choosing process should not be taken lightly and considering your long-term goals is also a must. Since you may want to concentrate on your reflexes for a few months and learning basic techniques like flying kicks can be your next goal. So if you get a bag which provides both of these, you will spend less money. After determining the bag type, you will need to determine the bag’s weight. For example, half of your bodyweight rule applies to classic heavy bags and more than your weight rule applies to freestanding bags. And reflex bags have so little weight. Basically, the weight is determined according to bag’s type. The Safety: It does not matter which heavy bag you choose. These are all “tough” except reflex bags and some are tougher than the others and provide more resistance than the others so wearing heavy bag gloves which have lots of padding and hand wraps are musts for your overall hand and wrist protection. However, some bags are quite soft like aqua bags and you really won’t need to use shin guards or gloves. So you can choose what you should do according to the bag’s hardness. Did I miss any type of punching bag above? If I did, please feel free to mention it in the comment section! Wow. I did not know that there were so many boxing bags on the market. I’m not a boxer myself but one of my friend’s son’s is soon turning 18 and he is into boxing big time so I was looking for a present for him and thought of that. I can’t see the price range of any of the bags on the article which makes me wonder if they are out of my price-range but what would you recommend for an 18 year-old who wants something general to practice with? Yeah there are even more and many of them are useless so I did not include above. If I did I am sure I would need to add at least a couple of thousands of words more. If you are interested in any of these bags, I provided links for more detailed descriptions and I compared the prices for material quality and which one deserves it etc. You can also find way more detailed information about filling and how to fill them with ease. If you are getting a present, definitely check out these gifts for boxers. There is a wide range of boxing gears and gifts on that writing. Many people just loved that gifts and that article became quite popular so I am sure you can find a gear for a young starter in there. It is always good to hear children participate in this sport. After reading this, you can determine a suitable bag for her needs. Guess what? I tried to do the whole punching the bag thing a long time ago. And I end up hurting myself while doing it! Nope, none of them ring the bell. I think I should stick with the Focus Mitts, it looks totally safe for complete beginners. Thanks for sharing this article, I always get to learn so much every time I visit your site! I guess your gloves were not protective enough. Or your aim, punching technique was not right. It happens especially if you are just starting out. Yeah, you can choose to do that. 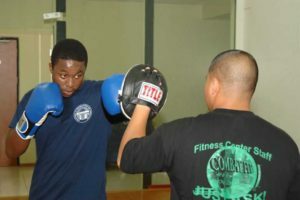 It can teach you the proper way to punch and your trainer can fix your mistakes. After that, you are readier to pound a heavy bag.